The CIS countries will coordinate action over the world financial crisis, says Russia’s President Dmitry Medvedev in an answer to the Voice of Russia special correspondent Yelena Studneva about the decisions of the CIS summit that was called in Kyrgyzstan’s capital city Bishkek on Friday. Here are the details. The Council of the Commonwealth Heads of State has shown the member-countries’ interest in promoting integration processes and has adopted 19 agreements on cooperation in different areas. This is what Dmitry Medvedev said on the raging world financial crisis. During the Bishkek summit, Dmitry Medvedev says, the CIS leaders reached agreement not to limit themselves to just a discussion, as was the G-8 practice in the past, but to coordinate decisions whenever this is seen expedient. Agreement has been reached to that end, the Russian President says, on that the CIS Finance Ministers will meet in Moscow in the next 10 days. 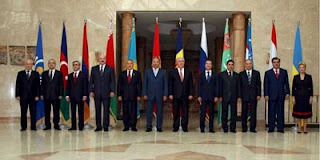 Dmitry Medvedev came out for calling an emergency summit of the world’s eight industrially developed nations. I have talked of this with my French counterpart Nicolas Sarkozy, the Russian leader adds. Unfortunately, the parties to the G-8 summit on Hokkaido in summer this year failed to discuss at length all the moves that should have been made in view of a world financial crisis threat, although all the parties were perfectly aware of that the crisis was looming large, Dmitry Medvedev complained. The Russian President said he had warned both during the Hokkaido summit and earlier still of the need to build new economic security architecture in the world. However, no decisions were made to that end. Therefore, every effort should be bent to take such decisions now. So everyone would benefit from calling a G-8 emergency summit. Dmitry Medvedev went on to say that if there should be a meeting to discuss ways to counter the raging world financial crisis, then the meeting should involve more than just the G-8 leaders, but also the leaders of other highly developed economies that determine the world’s financial climate, namely China, India, Brazil, Mexico, South Africa and, possibly, some other nations. According to Dmitry Medvedev, he’s got the impression that Europe understands that no economic global-scale problems can be solved in circumvention of Russia. We, the Russian leader underscored, closely depend on one another, so we should jointly discuss ways to deal with the current financial crisis.